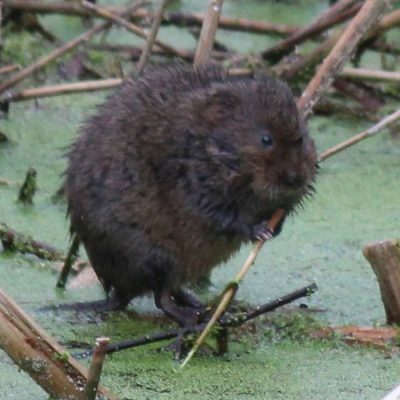 Keeping water voles safe at Portbury Wharf is very important. So the warden and his Portbury Wharf Nature Reserve Volunteers have been busy repairing the hurdles alongside the rhynes. You may have noticed them along Water Vole Lane, the path to the sea wall. The hurdles are there to keep the water voles safe by deterring unwanted swimmers. They live in the rhynes and will soon start breeding (we hope). In the UK their numbers are falling, so it is important that our Portbury Wharf water voles thrive. The vegetation along the bank is their lunch and they eat a lot of it! It also keeps them hidden from predators. So if we (and our dogs) stay away from the water and don’t trample down the bank, that will help them a lot. Water voles can be hard to spot. But if you are lucky enough to see one here, do tell us. The reserve lies between Portishead and Royal Portbury Dock. Access points are from Wharf Lane in Sheepway just off Junction 19 of the M5 motorway and from Portishead marina. This website is created for and maintained by Friends of Portbury Wharf Nature Reserve. The uplifting power of cranes? This was the amazing sunrise that greeted me as I walked by the nature reserve. A flight of Canada Geese completed the picture. There was a roebuck snoozing in the North Pool field while out on the salt marsh several curlews, many shelducks, a number of teal, a pair of oystercatchers, a duo of gadwalls and a common sandpiper was the icing on the cake. It was a lovely afternoon for a wildlife count with plenty to see from swallows and martins to orange-tip and peacock butterflies. Plenty of birdsong too including the joyful song of a skylark drifting down from over the salt marsh. This film was made by student Yazz Ellis with help from Portishead toads during this year’s migration. I hope you enjoy it as much as we have. With landing gear down these redshanks were among 60 that came to North Pool Island during our wildlife count yesterday. It was another high tide covering the salt marsh and reaching almost to the top of the sea wall. So waders like redshanks had few safe places to hold up until the water receded. Friends of Portbury Wharf Nature Reserve Community Group updated their cover photo. Some of our recent posts have shown roe deer bucks in velvet. The velvet is the soft hairy skin that covers and protects the new antlers while they grow. So here are a few more of our Portbury Wharf roe bucks in varying stages of velvet. Only the male roe deer have antlers and each year, around November time, they lose their antlers. However, new ones soon start to grow and by December you can just see the little velvet nobs of new antlers showing. Friday 22nd February 2019 at 7.30pm at the Folk Hall, Portishead High Street.